Fracking - accounts for ~50% of US drilling operations and is tied to groundwater contamination and possibly earthquakes. Worth it? Agriculture - where to start? The industry is a mess. From nitrogen and phosphate runoffs causing algae blooms in the Gulf of Mexico to the corruption of the distribution system, subsidies and the challenges of selective harvesting with crop diversity. All fun topics. US Drug Law - Particularly, opioids vs cannabis or even the class of sugar vs LSD. Lots of angles there. Climate change - Do people still not have skin? I mean, is climate change really up for discussion? The bigger question is why is it happening and what can/ should we do? All said, I don't understand why most of the above are partisan issues. We don't own the planet... we borrow it for our brief time here, why is it ok for us to create a mess for others to clean? I believe many of these are close to the hearts of millenials, such as myself. Isn't pretty much everything political these days? I think that's part of the polarization of the population, everything is one extreme or the other, and neither "side" has any tolerance for the other. What people do and why they do it are different. I also agree that it is very heavily a social issue. If you are unarmed, you can not defend your self. Totalitarian rule only works well if the populous are unarmed. For the rhetoric in the ad, it is a well worn and understood concept. So, they have a point. They defend your right, and promote safe usage of, firearms. They could have just said that. "We are the National Rifle Association of America. And we are Freedom's Safest Place." That would have been all they needed. And why I am so not a fan of two party politics. It creates a polarization, and suddenly just because one side holds something sacred, the other side obviously hates it, them, and is evil or stupid. If you need an example, look at Gordon's and Steve's understanding of the other side of the political fence. Evil, evil, stupid. Sun Tzu would know why their party is getting so little in the way of donations right now. Haidt brought up how Newt Gingrich produced this in a manner. Before the congress critters, blue and red, used to play together and intermingle, making friends and getting along. Post WWII they had worked together to win the war, save the world, and make everything great. Arm in arm. But after that, division came in and the bitter 60's and 70's, when people tackled high level social issues and started taking them down, sides started dividing the US. But we still had a connon enemy, the Soviet Union. Right as we sort that out, in pops Newt. You can see how the right became far more right, pushing out moderate conservatives and that was followed by the right doing the same. Positions became hardened, and then sacred flags, like Family First, or War on Drugs, or Multiculturalism, or Firearm Rights vs Firearm control all became much more sacred, protected. Extreme. Because there was far less activity between our Red and Blue representatives, and even now, between people who are moving to similar society in the US, who have a culture that matches theirs. We have a political class. And we make the mistake of allowing that, in some defiance of the original plan to have regular people from society take turns being of the people, for the people. Now we have of the political class, for the political class. And that doesn't even interact with the people or each other. Happy little circles playing just with themselves, insular. Haidt has been at the forefront of understanding this - I strongly, STRONGLY suggest looking him up, and watching as much as you can. His insight is just amazing. It is very easy to see how both sides tick when you realize what moral values people have, what they hold sacred, and why. He outlays a very interesting model of society, and why it needs these two positions, one to move forward, and one to protect us. Authority or respect: submitting to tradition and legitimate authority; opposite of subversion. A sixth foundation, Liberty (opposite of oppression) was theorized by Jonathan Haidt in The Righteous Mind chapter 8, in response to the need to differentiate between proportionality fairness and the objections he had received from conservatives and libertarians (United States usage) to coercion by a dominating power or person. 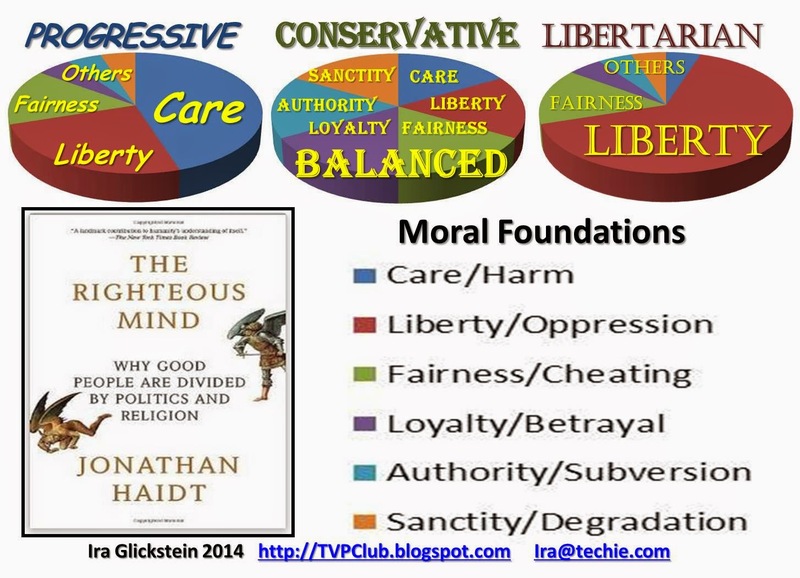 Haidt noted that the latter group's moral matrix relies almost entirely on the Liberty foundation. So, obviously, my moral value is Liberty, and that far out weights any other moral value in my opinion. I accept that is my flaw. The Left, and this happens in almost every nation, hold Care and Fairness far above any other moral value, and far left often reject Loyalty, Authority/Respect or Sanctity. The Right has a balance of all 5 moral values, for the most part. And interesting side act of the project is when the Left tried to respond to a series of questions as if they were on the right, they couldn't. They didn't comprehend the mindset. The Right could respond and answer as if they were on the Left though. Which perfectly explains the old saying "The Right thinks the Left is Stupid, the Left thinks the right is Evil." Basically what we saw played out by Steve and Gordon earlier. They can not comprehend the right side of the argument, and express their understanding as a series of irrational conclusions on motivations that are far from the truth, normally as "Why are you evil?" Ha! It comes from, as discussed above, staying in small circles, repeating the same BS, and when something comes up that might lightly affect your sacred totem keeping a very closed, tribal mind and response to everything. Watch some Haidt. Fascinating work. Last edited by pbjosh; 10-27-2017 at 09:33 AM. How do you quantify what levels of fairness and caring people have to claim balance and inbalance? I read a little of what has been said about haidt's work and it seems that the measuring stick for gauging these categories is based off of opinion which is effected by someone's ethics. I like that he is defining a moral structure that makes it easier to see where his ethics come from. But this will constantly lead to a moral dilemma though, because ethics vary by region and what is socially acceptable to them and the like minded people around them in their moral bubble. And opinion is the gauge as to what quantifies caring, fairness, etc, it is a rough thing to try and quantify. It is not really tied to groundwater contamination. Even the EPA, in trying to drill a fracking well to prove there was a problem came to the same conclusion. It is a mature technology for the most part, but also it is surrounded with a lot of misinformation. Interestingly, paid for by the Russians. Also, if you worry about those things like CO2s, Fracking is the reason US CO2 output has dropped. More Natural Gas at a cheaper rate has supplanted Coal Power plants, and since they put out more power with less CO2s, overall US CO2 is down. If you want to know much, I have extensive experience in oilfield development, pipelines and refining. I can point to 30 or 40 projects I have worked on involving the safety, controls, and emissions monitoring of refineries and related, large and small. It is actually pretty interesting tech, but I have moved into plants and power generation now. The discussion right now, in scientific circles, is the WHY. And it is great. It normally is a mess because the politics are heavy trying to make it more than it is, and the science is still very young. We need long term trends to test theories, and instead a lot of people jumped to conclusions. This is one of my favorite areas of study (decades in), but the discussion held by some who really care about the science of it is overwhelmed by the political partisan BS that has come out. Suddenly every one is supposed to be on one side or the other - and most of us playing with the data are going "Wait 10 years for us to figure out if this model works, or the other one!" Everybody wants to make it an emergency or an issue to ignore, when the answer really is patience. The CERN CLOUD experiment had some amazing results, we just had 2 major papers out that stated the problems in the nearly 100 models used by the IPCC, (this coming from the AWG crowd, not the skeptics), nearly 400 papers this year looking at natural variability and the effect of solar and other inputs. We just got up the OCO-2 satellite, and have data from just 1 year so far. We have 3 new models that need some time to run out. It is great to see. Especially after the flaws in the original theory ran everything hot by a factor of about 4. The discussion and science around it are fascinating right now. It is the best time to discuss it! If you can stick with the science. Because of the resulting problem in this graph, with the models used by the IPCC not correlating with other weather data. Now, one problem with the models is they held Solar output as a constant. And there are a few hundred new papers out on the subject of correlations of solar output and climate. I have barely been able to keep up with just a few of these. For papers showing a connection of solar and climate, one guy did make a list. He is at 400 from this year alone. Nan et al., 2017 The SST variation shows a millennial period of ~ 1500-yr and centennial periods of 131-yr and 113-yr. The ~ 1.5 kyr cycle dominated the period of 8.9–5.5 cal. kyr BP, suggesting a tele-connection between the Yellow Sea SST and global climate changes, might through the Kuroshio current. Centennial periods dominated almost all of cold periods recorded in core BY14, implying the signature of solar irradiance cycles by means of the strengthened East Asia Winter Monsoon (EAWM). Deng et al., 2017 The results indicate that the climate of the Medieval Climate Anomaly (MCA, AD 900–1300) was similar to that of the Current Warm Period (CWP, AD 1850–present), which contradicts previous studies. … As for the Little Ice Age (LIA, AD 1550–1850), the results from this study, together with previous data from the Makassar Strait, indicate a cold and wet period compared with the CWP and the MCA in the western Pacific. The cold LIA period agrees with the timing of the Maunder sunspot minimum and is therefore associated with low solar activity. Tejedor et al., 2017 Reconstructed long-term temperature variations match reasonably well with solar irradiance changes since warm and cold phases correspond with high and low solar activity, respectively. … The main driver of the large-scale character of the warm and cold episodes may be changes in the solar activity. The beginning of the reconstruction starts with the end of the Spörer minimum. The Maunder minimum, from 1645 to 1715 (Luterbacher et al., 2001) seems to be consistent with a cold period from 1645 to 1706. In addition, the Dalton minimum from 1796 to 1830 is detected for the period 1810 to 1838. However, a considerably cold period from 1778 to 1798 is not in agreement with a decrease in the solar activity. Four warm periods – 1626–1637, 1800–1809, 1845– 1859, and 1986–2012 – have been identified to correspond to increased solar activity. Here is an important part of the models, and why the last batch failed. In the first linked study from Nature, they stated the CO2 affect seems to be diminished, when correlating Observed to Modeled. What happens is, inside the formula, CO2 has a 1.1mw^2 affect, but it is supposed to have a multiplier from increased water vapor, a 3 times multiplier. That results in a 4.4mw^2 result in the models, but in reality the water didn't show up. In the models they held solar output as a constant. The new models now will have to only use the 1.1mw^2 for CO2 and also put in the solar output as a variable. This really changes the WHY as we knew it. In 2008 Margaret Zimmerman asked two questions of 10,257 Earth Scientists at academic and government institutions. 3146 of them responded. That survey was the original basis for the famous “97% consensus” claim. Out of 3146 respondents, they picked 79. In 2008. Now, if you asked me, or most climate skeptics. The answer is yes to both, in 2008. There is some significance. Placing me right there with those cherry picked 79. Or is it 77? Ah, 77. And, yes, most of the skeptics I read would have said yes 2 to both. WHY? It is a bad question. How significant is significant. Just a bit? $1 out of $100 isn't significant to most, but $5 or $10 would be. Most climate skeptics say CO2 is significant - but HOW significant is the question, and they feel the IPCC overstates it by a good amount. Well, look at reality vs the models. They do over state it. And now some in the AGW group have seen that, as linked to by the nature paper. Meteorologists and other atmospheric science experts are playing important roles in helping society respond to climate change. However, members of this professional community are not unanimous in their views of climate change, and there has been tension among members of the American Meteorological Society (AMS) who hold different views on the topic. In response, AMS created the Committee to Improve Climate Change Communication to explore and, to the extent possible, resolve these tensions. To support this committee, in January 2012 we surveyed all AMS members with known e-mail addresses, achieving a 26.3% response rate (n = 1,854). In this paper we tested four hypotheses—1) perceived conflict about global warming will be negatively associated, and 2) climate expertise, 3) liberal political ideology, and 4) perceived scientific consensus will be positively associated—with 1) higher personal certainty that global warming is happening, 2) viewing the global warming observed over the past 150 years as mostly human caused, and 3) perception of global warming as harmful. All four hypotheses were confirmed. Expertise, ideology, perceived consensus, and perceived conflict were all independently related to respondents' views on climate, with perceived consensus and political ideology being most strongly related. We suggest that AMS should attempt to convey the widespread scientific agreement about climate change; acknowledge and explore the uncomfortable fact that political ideology influences the climate change views of meteorology professionals; refute the idea that those who do hold nonmajority views just need to be “educated” about climate change; and continue to deal with the conflict among members of the meteorology community. The American Meteorological Society has released updated polling results of their membership [26.3% response rate] which shows only 52% agree with the so-called "consensus" that global warming is mostly man-made. The poll finds "members of this professional community are not unanimous in their views of climate change, and there has been tension among members of the American Meteorological Society (AMS) who hold different views on the topic." AH! But what about the Skeptical Science paper that said 97% of papers support AGW! OMG! Agnotology is the study of how ignorance arises via circulation of misinformation calculated to mislead. Legates et al. (Sci Educ 22:2007–2017, 2013) had questioned the applicability of agnotology to politically-charged debates. In their reply, Bedford and Cook (Sci Educ 22:2019–2030, 2013), seeking to apply agnotology to climate science, asserted that fossil-fuel interests had promoted doubt about a climate consensus. Their definition of climate ‘misinformation’ was contingent upon the post-modernist assumptions that scientific truth is discernible by measuring a consensus among experts, and that a near unanimous consensus exists. However, inspection of a claim by Cook et al. (Environ Res Lett 8:024024, 2013) of 97.1 % consensus, heavily relied upon by Bedford and Cook, shows just 0.3 % endorsement of the standard definition of consensus: that most warming since 1950 is anthropogenic. Agnotology, then, is a two-edged sword since either side in a debate may claim that general ignorance arises from misinformation allegedly circulated by the other. Significant questions about anthropogenic influences on climate remain. Therefore, Legates et al. appropriately asserted that partisan presentations of controversies stifle debate and have no place in education. Less than 1% of the paper Cook claimed were supporting AGW actually supported AGW. He lied. His last paper was redacted for bad science, and so was this one. Where does that leave the 97%? One set of cherry picked, badly asked questions with 2 out of 79 omitted, out of over 3500 omitted leaves us with a 97%. And a paper that basically is a lying hit piece that tried hard to fabricate 97%, but failed. Was retracted. And a survey from the AMS that shows a 52% approval. That is it. That is where the 97% comes from. It isn't really worthy of discussion. One bad quiz in 2008 and one bad paper in 2013. Sad people keep repeating it. Last edited by pbjosh; 10-27-2017 at 11:12 AM. the suns output has been shown to not be the driver. in fact, solar output has been on a slight decline throughout the warming period we are experiencing. wall-o-text is not an argument.